When it comes to helping employees, the Employee Relations department's priority is assisting supervisors and employees with work-related situations they may encounter. Acting as the employee's or supervisor's connection, Employee Relations team members help maintain and manage employer-employee relationships. 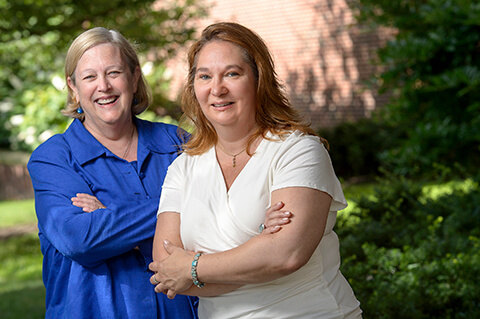 Sharon Williams, interim employee relations manager, and Connie Reckowsky, employee relations specialist, go a step further as certified employment law mediators. With the University's approved updates to the current grievance policy, which follows the Alternative Dispute Resolution (ADR) concept, taking effect July 1, Reckowsky's and Williams' roles become even more important. Why are updates being made to the University’s grievance policy? Reckowsky: Over the years, employees as well as supervisors and managers who have used the grievance process have indicated to us that they felt the grievance process was adversarial. Neither employee felt comfortable with the person they were displeased with sitting right across the table from them. We needed to find a way to take the stress and discomfort out of the process. What updates will go into effect on July 1? Williams: The updated policy will incorporate mediation at the first step. A trained mediator will meet with each side individually to gain an understanding of their concerns and what they are seeking as a resolution. The mediator is neutral and will work with each side to come to a mutually agreeable resolution. If resolution cannot be reached, either party can proceed to the second step. At the second step, each side will meet individually with a panel of trained peers. There will always be a faculty member on the panel in addition to someone from the administrative/professional staff and someone from the clerical/service staff. The panel will listen to the facts and make a recommendation on a resolution to the vice president for human resources, who will have the final decision for the University. What does the role of a certified employment law mediator for the University look like? Alternative Dispute Resolution program that provided opportunities to practice all phases of the mediation process. We are also members of the Association for Conflict Resolution, which provides us with ongoing training opportunities to continually incorporate new methodologies. As employee relations professionals, mediation is just one of the many skills we use to help individuals work through problems. What do you like best about being a certified employment law mediator and working in Employee Relations? Williams: We love the work we do in Employee Relations. The goal is always to focus on how we can make a working relationship better for both the employee and the supervisor. Sometimes there are issues that arise or problems that occur. It is great to have all sorts of tools to utilize in helping people solve problems. Mediation is one more tool at our disposal. There is a tremendous amount of satisfaction in helping people work through the issues so they can move forward positively. How do the policy updates and your roles as mediators play into the overall goals of Employee Relations? Reckowsky: Our goal is to help maintain and enhance a workplace environment that is productive and positive. Mediation allows both sides to focus on the problem and to resolve it without the stress of facing the other individual during a formal hearing. With the changes to the policy, it allows them to agree on a solution that can make it easier for them to work together in the future or to part ways in a non-confrontational way. What do employees need to remember about Employee Relations and the updated ADR policy? Williams: The Employee Relations team works on behalf of all employees to help ensure positive working relationships campus-wide. Employee Relations professionals offer faculty and staff a wealth of support, including consultation, guidance, workplace growth opportunities, conflict resolution, trainings and more to facilitate a favorable work environment for all. The grievance policy is a small part of what we do in Employee Relations. We are always available to discuss concerns with supervisors and employees in a confidential, problem-solving way. Reckowsky: All staff members in Employee Relations are dedicated to helping improve the work environment for all faculty and staff. We would be happy to meet with you about any concern you have in the workplace. We want to help you resolve these before it gets to the point of needing any formal process, including ADR. Any time you have a concern, let’s talk. For more information about how the Employee Relations team can serve you, visit them online. For specific questions for Sharon Williams, email her at ssw@purdue.edu or call 49-47398; for specific questions for Connie Reckowsky, email her at connier@purdue.edu or call 49-67260.